recognition as a leader in medical innovation and as a model for building bridges to peace in the Middle East. Dr. Ahmed Eid of Hadassah Hospital Mount Scopus, one of Israel’s top surgeons and an Israeli Arab, proudly represented HMO as one of 12 exemplary individuals to light torches at the official Israel Independence Day ceremony. In 2017, HMO was there to help the victims of crises—from terrorist attacks in Israel and hurricanes in the United States to the earthquake in Mexico, where Dr. Esti Galili-Weisstub, director of HMO’s Jerusalem Crisis Intervention Center and global expert on teen post traumatic stress disorder (PTSD), was able to assist Mexican health officials in formulating the nation’s response to psychological after-effects, particularly on children. 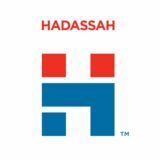 Hadassah has played an active role in helping to shape policy in the Jewish/ Zionist world by virtue of its inclusion in prominent national and global bodies, including the Conference of Presidents of Major American Jewish Organizations, Jewish Agency for Israel, World Zionist Organization, American Zionist Movement, and Jewish National Fund. Our privileged status at the United Nations as an NGO allows us to advance women’s health and gender equity as part of the UN Commission on the Status of Women. At HMO in 2017, our groundbreaking medical care included the world’s first dual-robot-assisted spinal surgery and the launch of Israel’s first and only Pediatric Palliative Care Center. We attracted top talent and world leaders, including a visit by US First Lady Melania Trump and Sara Netanyahu. Prof. Dina Ben-Yehuda became the first woman to serve as Dean of the Hadassah-Hebrew University Faculty of Medicine, and Dr. Tamar Elram took the helm at Hadassah Hospital Mount Scopus. Always looking to the future, we began the planning phase to reinvent and modernize the iconic Round Building of the Hadassah Ein Kerem campus, to keep it at the cutting-edge of medical innovation and world-class care. “I don’t think there’s any bigger and better partner with Jerusalem than the Hadassah Medical Organization,” said Jerusalem Mayor Nir Barkat. I’m honored to share some of these Hadassah highlights with you in the pages ahead. None of this would be possible without the generous support of donors like you. Let us continue to go from strength to strength, together. HADASSAH EXECUTIVE DIRECTOR/CEO DR. JANICE WEINMAN Every day in 2017, Hadassah, The Women’s Zionist Organization of America, Inc. (HWZOA) made a positive impact, saving lives, bridging divides, empowering women, advancing Israel, and showing what it means to live our values. This is the Power of Women Who Do, fueled by Hadassah’s unparalleled fleet of 300,000 volunteers, members, male Associates, and supporters around the country in more than 700 Hadassah chapters, who work in tandem with the national staff. Around the country in 2017, we rolled out new Hadassah programs to engage and expand our communities and cultivate the next generation of leaders, who find in Hadassah a meaningful expression of purpose within a Jewish framework. As an organization known for multigenerational memberships, Hadassah has an eye to the future. We embrace emerging technologies to engage our grassroots and new audiences, launching our first podcast series, “Hadassah On Call: New Frontiers in Medicine.” This series takes listeners behind the headlines of the Hadassah Medical Organization (HMO) through testimonies of doctors and nurses. In 2017, we laid the groundwork for our second podcast (launching in summer 2018), which shares real-life stories about Jews and Arabs in Israel making connections and working together. A fundamental part of our success has been through local, national and global collaborations. In 2017, for example, a new partnership with the Jewish Women’s Renaissance Project brought a cohort of young mothers to Israel, providing an immersive Israel experience (including first-person accounts of medical marvels at the Hadassah Medical Organization), and then a year-long curriculum that provides tools to change the world through Jewish values. As the nation’s largest Jewish women’s organization, we face the same challenges as other volunteer organizations and nonprofits. Yet HWZOA remains a formidable institution with a broad mandate. In 2017, we had 172 health and wellness events that reached over 20,000 inperson attendees, a number boosted by our deepening ties to the JCC Association, which brought Hadassah programs to 20 JCC communities. We understand how important it is to create the kind of organization that attracts outstanding professionals in our sector. In 2017, we began the process of bringing in new top talent to help our leadership team—volunteers and staff —strengthen our organization and impact. We instituted a new staff development process with a focus on better understanding each person’s background and an updated evaluation process to help our professionals build their strengths. We created and filled a new position—Chief Human Resources Officer—and began what proved to be extremely successful searches for a Chief Development Officer and a Chief Financial and Operations Officer. Hadassah takes an active role in shaping and lifting up important conversations. In 16 communities, our volunteer leaders are teaching classes on Jewish Values & the Israeli-Palestinian Conflict, a topic many younger Jews are grappling with. (Our teachers were trained by our partners at the Shalom Hartman Institute.) And Hadassah’s Defining Zionism in the 21st Century series brought timely public dialogue to new audiences through live events, online videos and opportunities to view via Facebook live, with diverse speakers exploring feminism and Zionism, intersectionality, interfaith initiatives, and more. Today, there are 76,000 professionals working to improve the world at Jewish organizations. According to Leading Edge’s 2017 report, a followup to “Cultivating the Next Generation of Leaders for Jewish Nonprofits,” most are struggling to maintain and attract talent. Our power comes from the people who share our vision. We hope we can count on you as our continued partner. HADASSAH M 3-D mammography—that can raise breast cancer detection by up to 30%. We also have installed contrastenhanced digital mammography that enables physicians to diagnose the extent of the disease in a quick, simple procedure. For our fast-growing Israeli population—talking about hit’hadshut—we are renovating our busy Delivery Department on Mount Scopus. We have also broken ground on a new Rehabilitation Center there, so that we never have to turn away soldiers and civilians who need our help. We’ve also opened an HMO clinic in Ramat Gan. Of course, buildings and equipment are only part of what a hospital needs to excel. The internationally recognized, gifted staff of doctors, nurses and paramedical staff are the heart of the hospital. And speaking of hearts, The Irma and Paul Milstein Heart Center is moving into its rightful place in the Sarah Wetsman Davidson Hospital Tower. In Mexico, coordinated by Hadassah International, pediatric psychiatrist Dr. Esti Galili-Weisstub taught local therapists to cope with the traumas of children after the earthquakes, while two Mexican doctors trained in plastic surgery fixed cleft palates. HMO’s medical team carried out complex spine surgery on children in Ethiopia. Cardiologists and pediatric cardiothoracic surgeons are treating Syrian children at Hadassah Ein Kerem. Remember that image of holding hands around the world? That’s how I feel about our newest endeavor, transforming the historic Round Building into a futuristic complex. Those of us in Israel and those in the Diaspora, are joining hands in 360 degrees of healing. H MEDICAL ORGANIZATION Neuropsychiatry Lab—published in The Lancet Psychiatry—advance our understanding of brain networks. Dr. Arzy and his team are also making waves for their sophisticated new diagnostic tools for Alzheimer’s disease. • In-Utero Surgical Success In a risky in-utero procedure performed for the first time in Israel, an interdisciplinary HMO team saved a 28-week-old fetus with a severe heart defect. Dr. Yuval Gielchinsky appears on the cover of Forbes Israel Magazine in recognition of HMO’s lifesaving interventions with babies in utero. HUMANITARIAN HIGHLIGHTS • Gaza Children Hear for the First Time Mohamed, a 4-year-old who was born deaf and never learned to speak, was one of 15 children from Gaza and the West Bank who regained their hearing after cochlear implant surgery at Hadassah Ein Kerem. • Global Disaster Response HMO’s Dr. Esti Galili-Weisstub—a global trauma expert—helped the Mexican government, after the devastating earthquake, develop its strategic response to long-term psychological impact. The Mexican Health Secretary thanked Dr. GaliliWeisstub, praising the strength of the Israel-Mexico relationship. TACKLING THE TOUGHEST PEDIATRIC AND PRENATAL CASES • Israel’s first Neonatal Intensive Care Unit (NICU) opened at Hadassah Ein Kerem, combining advanced technology with a multidisciplinary professional team. • A world-first surgical procedure saved a baby whose intestines formed outside of her abdomen. • HMO inaugurated its Pediatric Palliative and Supportive Care Center, providing infants and youth who have life-threatening or complex medical conditions with comprehensive, holistic care and family-centric support. LEADERSHIP AT LARGE • Modeling Peace US First Lady Melania Trump and Sara Netanyahu visited Hadassah Ein Kerem, putting an international spotlight on HMO as a “center of coexistence” in Israel. Shortly afterward, Prime Minister Benjamin Netanyahu and Health Minister Yaakov Litzman visited IDF soldiers injured in a terrorist attack being treated at HMO, thanking them for their service. 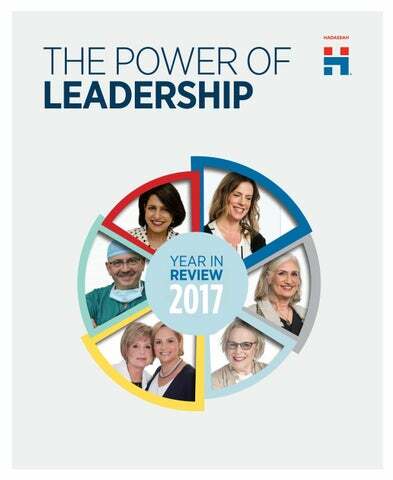 • Women’s Leadership at HMO in 2017 Dr. Tamar Elram became the director of Hadassah Hospital Mount Scopus, and Prof. Dina Ben-Yehuda became Dean of the Hadassah-Hebrew University Faculty of Medicine—the first woman to have the position. AMERICAN SCHOOLS AND HOSPITALS ABROAD PROGRAM • Women’s Health Center at Mt. Scopus The US Agency for International Development has provided approximately $1 million per year to the Hadassah Medical Organization since the 1960s, supporting HMO through the American Schools and Hospitals Abroad program (ASHA). ASHA provides sophisticated medical equipment to Hadassah’s hospitals to ensure they can deliver high-quality clinical care to everyone in need regardless of race, religion, gender, ethnic origin, age, or sexual orientation. In 2017, the ASHA program delivered a range of essential equipment for the new Women’s Health Center at Hadassah Mount Scopus, including mammography machines, ultrasound devices, and special monitors for mothers and babies. THE POWER OF HEALIN DR. RADGONDE AMER OPHTHALMOLOGIST EXTRAORDINAIRE When Dr. Radgonde Amer, then a medical student in Jordan, saw the back of the eye for the first time, she fell in love. “It’s so beautiful,” she said. “I knew at that moment that I would make ophthalmology my life’s work.” Born in Jerusalem to a Christian Arab family (her younger brother Johnny is a PhD researcher in the Hadassah Medical Organization’s Liver Department), her rare first name comes from a sixthcentury French princess who escaped from a Hamlet-like royal intrigue and became a saint. That Radgonde became a renowned healer. The name choice was prophetic. Today Dr. Radgonde Amer heads HMO’s Uveitis and Ocular Immunology Service in the Department of Ophthalmology. She received her medical degree at the University of Jordan in Amman, then returned to Jerusalem to do her residency at Hadassah Hospital. During that period she saved the eye of New Yorker Jamie Sokolow, then 12, who survived a Jaffa Road terrorist explosion, earning Dr. Amer accolades from then First Lady Hillary Clinton. Uveitis is the inflammation of the uvea, the pigmented layer including the iris between the better-known retina and cornea. Dr. Amer specialized in uveitis at the Aberdeen Royal Infirmary in Scotland, under Dr. John Forrester. Dr. Forrester and Dr. Amer are still in close contact and Dr. Forrester plans to attend HMO’s Centennial Celebration of Ophthalmology in 2018. Dr. Amer opened HMO’s uveitis clinic in 2007 at the request of then Department Head Prof. Jacob Pe’er. The clinic serves a community of over a million men, women and children. Uveitis and other ocular immunological diseases link ophthalmology and internal medicine, another field that engages her. “Eye disease doesn’t all start in the eye,” she said. For example, she was called for a consultation about a young woman in the Internal Medicine Department. The patient couldn’t move her head to either side, and her vision was blurry. Her situation was critical. The teen’s blurred vision was related to juvenile rheumatoid arthritis, a systemic disease that affects joints and eyes. It’s one of Dr. Amer’s specialties. “We’re blessed in Israel with a very fast referral service when general doctors and general ophthalmologists quickly send patients to experts at Hadassah Hospital in most cases,” said Dr. Amer. “Despite this clear case of parental neglect, we were able to reverse the disease, ease her joints and save the teen’s vision.” The diseases she deals with have often been misdiagnosed. Take Behçet’s disease—the highest prevalence of which is in Turkey. It starts with mouth sores, so the diagnosis does not become clear until much later when the patient develops uveitis and visits the ophthalmologist. THE POWER OF CARI N RUVEN GELFOND CHIEF NURSE OF ORTHOPEDIC SURGERY “It may sound banal, but if you need to take blood from a patient to use later in his or her own surgery and you don’t have the exact sterile equipment, the entire surgery may be compromised,” said Ruven Gelfond, who speaks from his experience handling logistics and nursing for life-saving Hadassah Medical Organization (HMO) humanitarian missions, often to places lacking modern medical facilities. “At HMO there is a blood bank, for example, but in Ethiopia there isn’t.” Gelfond, 47, is renowned for being able to predict a need or to come up with a creative answer when there is no obvious solution to a problem. It’s an invaluable trait for the doctors he works with as Chief Nurse of Orthopedic Surgery at Hadassah Hospital on the Mount Scopus campus. Indeed, it was Gelfond who headed the team to set up Israel’s field hospital in Haiti in 2010 and who was sent by the IDF (Israel Defense Forces) to the Philippines after the typhoon in 2013. He’s also served in the IDF’s Good Neighbor field hospital, treating Syrians devastatingly injured in their civil war. Born in 1970 in Tbilisi, the capital of Soviet Georgia, he finished nine years of school before being sent to a practical nurses course in Vitebsk, Belarus, hometown of Marc Chagall. His inborn ability to think out of the box was nurtured from his first job, when he was placed in charge of the community health clinics in five villages. “I had to deal with whatever came my way— giving shots, delivering babies, and treating the elderly,” said Gelfond. He was 18 years old. After completing a two-year stint in the Red Army, he moved with his parents and siblings to Israel in December 1992, in the first wave of Russian aliyah. After a crash course in Hebrew, he signed up for a program (sponsored by Hadassah, The Women’s Zionist Organization of America) to train Russian medical professionals for work in Israel. “It was a time of tremendous learning for me,” he said. “True, I had more experience than many other students, but there was so much to become familiar with. I never took it for granted that Hadassah would invest so much in my training, and I’m grateful.” He filled in both his academic and technical background, and went on to specialize as an operating room nurse. He also served in the IDF, becoming part of the YAKAM field hospital team. Today he’s an officer with two stripes on his shoulder, serving in the Reserves and on-call for emergency missions abroad. Gelfond is married to Inna, an economist turned nurse. One of their children is studying medicine in Slovakia, another is in the Israeli Air Force. MEN’S PHILANTHROPY LINDA S. GOLDSTEIN Linda S. Goldstein inherited a passion for giving. “My parents, Benjamin and Yetta Fried z”l, met at a Jr. Hadassah dance, fell in love, and married two weeks later,” said Goldstein. “I wouldn’t be here if not for Hadassah!” Goldstein passed along the philanthropic gene to her three children who, in turn, led their offspring along the same path. Goldstein kvells, “My mother and I had the privilege of installing my daughter, Esther Panitch, as president of her Hadassah Miami chapter. Then I had the amazing honor of my daughter, Esther, installing me as Hadassah Greater Miami President.” In 1966, during Goldstein’s third year of college, she studied at the Hebrew University of Jerusalem. “At the start of our year, we visited the beautiful Hadassah Hospital Ein Kerem and its Chagall windows. But in June 1967, the Six-Day War broke out. My dorm was almost converted to a hospital.” Goldstein chose to stay and help. “After the war, I witnessed the terrible state Hadassah Mount Scopus was in, but I knew the women of Hadassah would make it whole again.” Her experiences in Israel made a tremendous impact on Goldstein and inspired her lifelong support for Hadassah. “As a CPA, I recognize the importance of philanthropy to a nonprofit organization. I am a proud member of the Society of Major Donors as well as a Golden Keeper of the Gate.” Looking to the future, she’s “currently raising funds to renovate the iconic Round Building” on the Hadassah Hospital Ein Kerem campus, part of the 360 Degrees of Healing campaign. Women’s Health Equity: In 2017, Hadassah convened the first Women’s Health Empowerment Summit with the Coalition for Women’s Health Equity, bringing together more than 150 advocates, grassroots leaders, students and government representatives. In 2017, the Coalition grew to 28 member organizations, doubling in size from its founding by Hadassah in 2016. Coalition member organizations work together to address health inequities, from prevention and diagnosis, to treatment and cure. Meeting with Policymakers: Hadassah organized more than 20 legislative meetings to advocate for a strong US-Israel relationship and on bills to combat anti-Semitism and BDS, as well as women’s health, and other policy issues. These meetings with US Senators, Representatives, and congressional staffers in their district offices were the first phase of a strategic national push to expand local efforts and grow Hadassah’s Day in the District program. Date with the State: California State Senator Henry Stern met with Stacey Dorenfeld and Stacey Devries, co-chairs of Hadassah Southern California’s “Modern Day Slavery: An Insight Into Human Trafficking” event. Senator Stern introduced Senate Bill 225, which would require hotels to publicly post the number for the human trafficking hotline. Standing Up for Immigrants and Refugees: Hadassah proudly advocates for immigrants and refugees, passing a new policy statement in January 2017. Hadassah joined with a long list of elected officials and community leaders in supporting the Deferred Action for Childhood Arrivals (DACA) program and advocating for comprehensive bipartisan immigration reform. briefs in 2017, including on reproductive health, LGBT rights, and religion-state separation. The Attorneys Council is one of several Hadassah professional networking councils. Hadassah Leadership Fellows: In 2017, Hadassah’s elite fellows spearheaded the creation of Hadassah’s young women’s network, EVOLVE (Engage, Volunteer, Opportunity, Leadership, Vision and Empowerment), which creates Hadassah events for savvy younger Jewish women committed to women’s health, volunteerism, Zionism, and Jewish identity. Cultivating Local Leaders: Hadassah’s many strategic partnerships include a collaboration with the Jewish Women’s Renaissance Project (JWRP) to empower women to change the world through Jewish values that transform themselves, their families, and their communities, through trips to Israel and follow-up support. The initial program in 2017 with Hadassah Greater Chicago-North Shore (CNS) was successful, with 80% of CNS participants on track to take local Hadassah leadership positions. Plans are under way to expand this program to 10 new cities by 2019. Speaking Out on the Issues: We sent over 33,000 messages to elected officials on women’s health, women’s economic equity, violence against women, immigrant rights, and against hate, racism, and white supremacy. SAH IN ACTION posts and live cooking demonstrations at high-profile Hadassah events. Education Saves Lives: Hadassah is well known for its ability to engage and educate communities around the country, bringing 20,000 individuals the tools they need to live healthier lives. In 2017, Hadassah held more than 172 health and wellness events focused on heart disease, nutrition, breast cancer, women’s health equity, melanoma, multiple sclerosis and more. President Ellen Hershkin at an official ceremony marking the 50th anniversary of the return of Hadassah Hospital Mount Scopus to Hadassah after the Six-Day War. Immersive Israel: Each year, Hadassah leads guided tours to Israel, helping Diaspora Jews forge connections to Israel, Hadassah’s Youth Aliyah villages and the work of the Hadassah Medical Organization. In 2017, Hadassah trips to Israel included the Geopolitical Mission, with stops in Rawabi and Ramallah, and briefings from military and political insiders. Youth Programs: Hadassah scholarships supported 412 youngsters and their families enabling them to attend Young Judaea programs in the US and Israel. “I don’t think there’s any bigger and better partner to Jerusalem than the Hadassah Medical Organization,” Programs with Purpose: Hadassah members raise awareness about breast cancer and the lifesaving work of the Hadassah Medical Organization, whose researchers were the first to identify the BRCA gene mutation’s disproportionate appearance among Ashkenazi Jews. Hadassah women have taught breast cancer awareness education for 20 years, reaching 1 million teens around the country with Check It Out®. As part of Breast Cancer Awareness Month in 2017, Hadassah raised awareness in Florida—and funds for HMO—with displays of artist-decorated bras at five Bloomingdale’s locations, mirroring efforts in other states. Hadassah Magazine takes home seven 2017 Simon Rockower Awards from the American Jewish Press Association. FOSTERING SUPPORT FOR ISRAEL Thought Leadership: As part of our efforts to advance civil dialogue on Israel in the United States, our Defining Zionism in the 21st Century program hosted 17 speakers addressing timely topics such as feminism and Zionism, intersectionality, interfaith initiatives, reaching millennials, and more. Created as an online video series, the program interspersed live events and a strong social media presence, including a 2017 Facebook reach for Defining Zionism of 129,143 people. Teaching Values: Emerging Hadassah leaders began teaching classes on “Jewish Values & the Israeli-Palestinian Conflict” in 16 communities around the country, using the Shalom Hartman Institute’s iEngage syllabus. POWER OF ADVOCACY KINDRA COOPER Mix a Jewish Seattle lawyer with two master’s degrees—one in bioethics, another in public administration—and you get powerhouse advocate Kindra Cooper. After joining the board of directors for Hadassah’s Seattle chapter, Cooper dove right into service as their Advocacy Committee Chair. Within months, Cooper was representing Hadassah at statelevel Jewish advocacy events including a panel discussion aimed at community education, and a Jewish women’s advocacy training. Since then, she and other members of her chapter have represented Hadassah in a Day in the District meeting with US Congresswoman Pramila Jayapal, discussing gender equity in health care and medical research, and in a meeting with Senator Patty Murray’s outreach director, discussing Hadassah policy priorities including support for family caregivers and women’s health equity. For Cooper, advocacy is a perfect expression of her Jewish ideals, like tzedakah (charity and justice) and tikkun olam (repairing the world). It was a deeply personal experience, however, that brought her to medical advocacy. Janice Weinman was appointed in June 2012 as the Executive Director/Chief Executive Officer of Hadassah, with over forty years of experience in the not-for-profit and government sectors. She came directly from her post as President of K.I.D.S., an organization supporting millions of children in need in communities across the United States and overseas. Prior to her position at K.I.D.S., she served as Vice President for External Affairs of The Mount Sinai Hospital/NYU Medical Center and Health System in New York, where she was responsible for government and community relations, marketing, communications and public affairs of the five-hospital consortium. Naomi Brunnlehrman is the Director of the PRogramming, Advocacy, Zionism and Education (PRAZE) Division. Naomi has been an advocate for over 30 years and is a cofounder of The Jewish Deaf Resource Center, which builds bridges between individuals who are deaf and hard-ofhearing and the wider Jewish community. She is a tri-lingual interpreter, a past Assistant Vice President at KeyCorp, a Software Conversion Project Specialist for over 10 years and most recently worked at DOROT as their Education Director. Naomi has her MA in Jewish Studies from the Graduate School of the Jewish Theological Seminary of America and has an advanced certificate in Jewish Philanthropy from Yeshiva University. her synagogue, and has also served on various boards and committees, including the Jewish Theological Seminary (JTS) Cantorial School Focus Group and the JTS Cantorial School Task Force. Sheryl graduated from Rutgers University with a BA in Communications. Bart R. Minsky is the Chief Human Resources Officer. He has over 30 years of Human Resources experience including Chief Human Resources Officer and other senior HR leadership roles. Prior to Hadassah, Bart served as a Human Resources consultant to the healthcare industry and before that was Vice President of Human Resources at New York-Presbyterian Hospital. He graduated from the University at Albany with a BA in Economics and from the New York Institute of Technology with an MS in Labor and Industrial Relations. Bart holds Senior Human Resources certifications from the HR Certification Institute and the Society for Human Resources Management. Joshua W. Rednik, CFP® is the Chief Development Officer. He has more than twenty years of experience in the non-profit sector, managing organizations and developing and executing multi-milliondollar fundraising campaigns. Prior to joining Hadassah, Josh served as President and CEO of the Diabetes Research Institute Foundation (DRIF) from 2014-2018, where he and his team raised over $60 million from foundations, corporations and individuals in support of DRIF’s mission to cure type 1 diabetes. Josh is a graduate of Washington University in St. Louis with a BA in Psychology and received his MSS in Social Service at Bryn Mawr College, Bryn Mawr, PA. He is a Certified Financial Planner™ professional, having received an Executive Certificate in Financial Planning from Georgetown University in Washington, DC. Hadassah, the Womenâ&#x20AC;&#x2122;s Zionist Organization of America, is a volunteer organization that inspires a passion for and commitment to the land, the people, and the future of Israel. Through education, advocacy, and youth development, and its support of medical care and research at Hadassah Medical Organization, Hadassah enhances the health and lives of people in Israel, the United States and worldwide.  2018 Hadassah, The Women’s Zionist Organization of America, Inc. Hadassah, the H © logo, Hadassah the Power of Women Who Do, Every Beat Counts: Hadassah’s Heart Health Program, Check It Out are registered trademarks of Hadassah, The Women’s Zionist Organization of America, Inc.